When you’re on a roll, feeling lively, and in need of something hot, quick, and delicious to keep you going, Del Oro is the place to be. Stop by for a hot dog, pizza and other fun foods to wash down with the drinks from next door. Take the fun-factor up a notch with drinks, appetizers, and live entertainment at this full-service bar. Located right next door to the Del Oro Deli, Player’s Bar is a fan-favorite here at Golden Acorn – and not just during happy hour. Come see for yourself! Say what?! Yep. Not only do we have multiple dining options – and plenty of menu items for every taste and budget – but we also have specials that earn you FREE Play! Fuel up with the breakfast special anytime between 6:00 a.m. to 11:00 a.m. Monday through Friday and Receive $5 FREE Play. 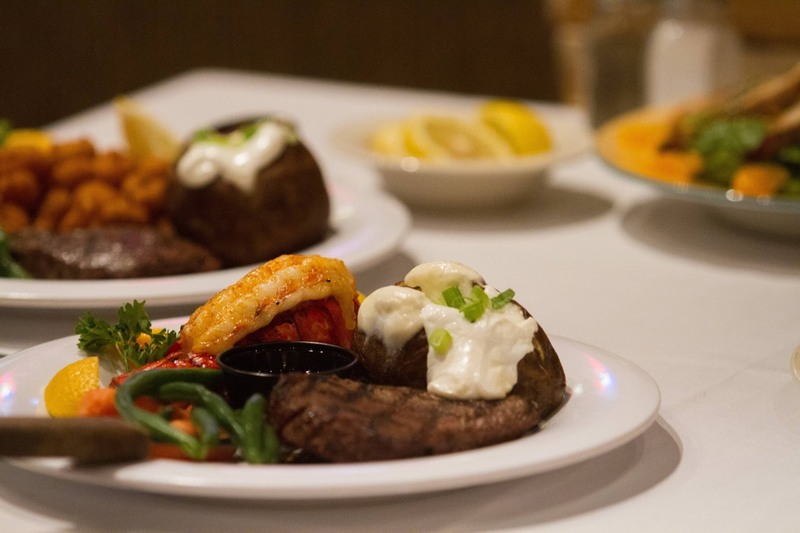 This weekday surf and turf will Earn you $5 FREE Play Monday through Thursday, from 11:00 a.m. to 9:00 p.m.
You can enjoy juicy steak and succulent lobster and Earn $5 FREE Play every Friday and Saturday from 11:00 a.m. to 10:00 p.m.
To redeem your FREE Play from any of these specials, just bring your receipt to the Player’s Gold Club booth. So, do you think you’ll eat first or play first? Will you eat-play-eat-play or will you play-play-play-eat-eat-eat? You don’t have to decide now. Just hit the road, come out to Campo, and see how the day unfolds. At Golden Acorn Casino, we’ll supply the games and the food, and the rest is entirely up to you.